Don't see your answer below? Then email us or call (916) 808-7000. Can I use an image from your collection? How do you acquire art? The Crocker Art Museum acquires objects appropriate for its collections through gift, bequest, and purchase. How many pieces are in the collection? There are over 15,000 objects in the collection. Objects and collections are rotated frequently through the Museum's active exhibition program. What is the Crocker Art Museum Foundation? The Crocker Art Museum Foundation (CAMF), a subsidiary of CAMA, was established in the 1980s to manage endowment funds to provide a reasonably stable and predictable stream of income to CAMA. What is the Crocker Art Museum Association? The Crocker Art Museum Association (CAMA) is a private, nonprofit public benefit corporation exempt from federal income tax under section 501(c)(3) of the Internal Revenue Code of 1986. CAMA shares governance of the Crocker Art Museum with the City of Sacramento. How is the Museum funded? The Crocker is funded through a combination of public support (55 – 60%), earned income (25 – 30%), income from investments and endowment (4 – 7%), income from programs (3 – 7%), and a general fund allocation from the City of Sacramento (20 – 23%). Public support is provided through gifts from individuals; corporate, foundation, and governmental grants; Museum support groups; memberships and fundraising events. Earned income is derived from admissions, Museum Store sales, and facility use and food service revenue. Investment income is derived from a draw on earnings of the Endowment and interest on cash reserves. How is the Museum governed? The Crocker Art Museum is a public-private partnership established in May 1885 by a Deed of Gift from Margaret Crocker to the City of Sacramento. The Deed gave joint and equal control and management of the property known as the "E. B. Crocker Art Gallery" to the Mayor of the City of Sacramento and California Museum Association (today the Crocker Art Museum Association) as co-trustees. How does the Museum schedule exhibitions? Exhibitions organized or hosted by the Museum are typically scheduled three years in advance. Selection is based on a variety of criteria. Curators routinely review slides or CDs of work by contemporary artists. To share your work, please send materials by mail and include a self-addressed and stamped envelope, if you wish for your materials returned. Send materials and SASE to the Curatorial Assistant, Crocker Art Museum, 216 O Street, Sacramento, CA 95814. 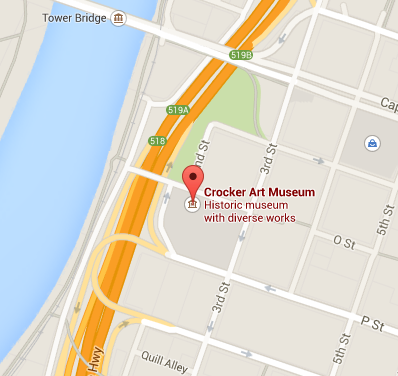 Why is the Museum sometimes called the Crocker Art Gallery? The Museum was known as the E. B. Crocker Art Gallery until 1978, when it was renamed the Crocker Art Museum. In late Victorian times, the word "gallery" described a series of large, public rooms in which art was displayed. In contemporary usage "gallery" generally refers to a place that sells art, or that has a small, or particularly focused collection. Currently, the word "museum" is more suited to a large, public institution where art of various periods can be experienced. So today, "museum" better expresses the mission for which the Crocker was founded. The history and vision of the Crocker Art Museum is rooted in the lives of its founders, Judge Edwin Bryant Crocker and Margaret Rhodes Crocker. You can click on our About page to learn more about the family. How do I submit an artwork or exhibition proposal? The Curatorial Department aims to stay aware of current works being produced in and out of our region, and welcomes submissions from artists. However, due to the large volume of submissions, we often cannot respond individually. Should the curatorial staff determine that the submission is appropriate to a program or exhibition we will contact you. Suggested materials for submissions include printed or digital images of the work, an image list including title, date, medium, and dimensions, a resume or curriculum vitae, and a self-addressed stamped envelope if you wish for your materials to be returned. Email your submission to Cristina Urrutia, Curatorial Assistant at currutia@crockerart.org, or mail your materials to the Crocker Art Museum, Curatorial Department, 216 O Street, Sacramento, CA 95814. Can I get more information about an artist listed on AskArt.com? Where can I have a work of art cleaned or conserved? The Museum does not provide conservation services. If you are interested in having a work of art appraised or conserved, we suggest that you consult a reputable art dealer, appraiser, auction house or conservator. Click here for a suggested list of appraisers and conservators. Where can I get refreshments? The Crocker Cafe by Supper Club on the first floor offers a wide variety of food and drink options. Can I take photos of the artworks? The Crocker loves photography! With some exceptions, personal photography of artwork in the Museum’s permanent collection is allowed; however, flash, tripods, or video equipment is not permitted without permission from our Marketing Department. Due to the sensitive nature of the art, photography of works on paper is not permitted. Photography of special exhibits or loaned works of art is sometimes not allowed due to copyright restrictions. In those instances, posted signs will let you know that photography is not allowed. It is best to ask a security officer or visitors services representative at the admission desk about which works may be photographed. Professional photographers or those with professional equipment such as tripods, flash, and lights must receive approval prior to photography in or around the Crocker Art Museum, and must be accompanied by a member of the Museum staff. Printed or electronic images for either publication (including electronic publication) or commercial use must be approved by the Museum prior to photography. What can I bring into the galleries? To help us keep the art safe, we ask that you keep food, drinks, gum, umbrellas, backpacks (including backpack baby carriers) and ink pens out of the galleries. A self-serve, coin-operated coat and parcel check is located on the first floor. Strollers, chest-carried baby packs, and pencils are permitted.